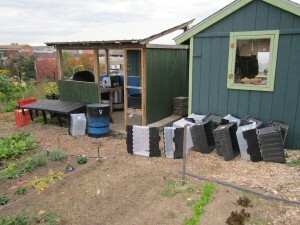 The Community Garden on 8th avenue in Troy, NY, is a part of the Capital District Community Gardens. The Capital District Community Gardens (CDCG) is a year-round program that helps underprivileged youth in the area to gain working experience and thereby increasing both their educational as well as their employment opportunities. It also helps solving another problem. Since the city populations are climbing and the demand for locally-grown foods are rising, the CDCG provides a relief by promoting urban agriculture industry. As with every other group of people, the people working at the CDCG both has special wants and needs. First of all it is only volunteers and local kids working there in weekdays. That means that you have to take into account that people are there because they enjoy it somehow. And that joy has to be maintained in the proposed design. At the garden they have different working areas for different tasks, and based on a combination of both their needs and our interest from the group, our group decided to work with their wash station. It seemed like a problem area that made some tasks more laborious than needed and thereby less fun. And it is also a central hub for taking the crops from the garden and out to the local community. One of the other major areas they presented us to was the covering and uncovering the crops in the late fall/early spring. Currently they are using Remay which they have to manually take on and of. They recommended a mechanical solution that could help them going from two to one person (it currently takes two). But we thought that project was a more technical rather than social project where you had to build a machine to do the task for them. So one of the main reasons why we chose the wash station over the Remay project was because it involved more understanding of the people working there and taking into account their wants and needs rather than building a device.